Everybody knows how important it is to keep their sheets and other bedding clean, but not everybody is as up to snuff on their mattress cleaning protocol. When you consider the fact that most people spend an average of at least 8 hours up close and personal with their mattress every night, cleanliness starts to seem a lot more imperative. Even though your mattress is protected with sheets, it still collects germs and bacteria over time—mostly from sweat and dead skin cells that you release over night. In more extreme cases, an unattended mattress can become infested with bed bugs or mold—both of which can lead to serious health issues. Luckily, you don’t need to stress about these problems, because we’re here to walk you through cleaning your mattress to ensure a germ-free, good night’s sleep! This is something you should be doing every six months or so to keep your mattress comfortable, but it’s also a great way to keep your mattress clean. As people are creatures’ of habit, we often only use one section of the bed. This means that each night sleep’s worth of sweat and skin cells are going to the same area of the mattress. Flipping it will prevent a buildup of these bacteria in one location. Vacuuming your mattress is easy, and can be done every couple weeks to keep dust and dirt to a minimum. By keeping particles to a minimum, you’ll also reduce the chances of staining if your mattress gets wet. Most department stores sell upholstery cleaner, which is specially formulated to be used on surfaces that touch your skin. You can also buy more heavy-duty upholstery for a good price at most pet stores! Although it’s developed with pet stains in mind, it will also remove sweat marks and any other spills from your mattress. Best of all, it also contains enzymes that will deal with odours. 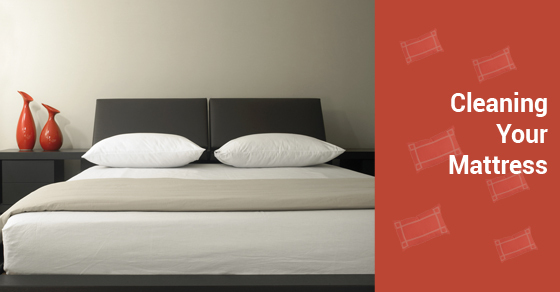 For stubborn and unsightly mattress stains, make a paste mixture of baking soda, salt, and water. Rub it on the area, and brush it off after half an hour. Wipe it entirely with cold water, and leave to dry. If this doesn’t work, try a mixture of one pare Hydrogen Peroxide to two parts dish soap. Over time, mattresses can develop their own odor. Avoid this buy sprinkling baking soda on your bed and leaving it for at least an hour. For a stronger effect, mix a couple drops of essential oil in the baking soda before hand and shake it to distribute it. Vacuum up the baking soda afterwards and you’ll have a fresh scent to your bedroom.